Many parents prefer to have their baby sleep close to them, especially during the early infancy. Although a crib is a great place for a baby to sleep, cribs are often big, bulky and can't be put next to your bed. Bassinets are perfect for such situations. They are small, portable and easy to move around. 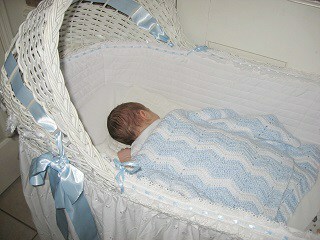 Hence, many parents prefer to use a bassinet for their newborn babies before shifting the baby to a crib. As with any baby product, buying the right bassinet for your baby can be frustrating. There are literally hundreds of makes and models out there and going through the spec sheet of each one of them is a time-consuming process. Moreover, if you don't know what to consider before buying a bassinet, things can get even murkier. Well, now that you are here, don't worry about a thing! In this article, I will discuss everything you need to know about bassinets so that you can shop with confidence. In the second half of the article, I will also take a look at some of the best baby bassinets that you can buy. 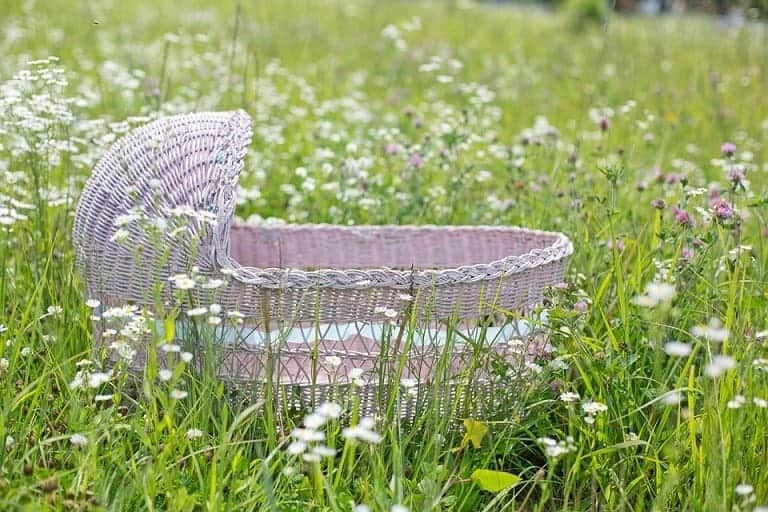 Trust me, by the end of this article; you will be shopping for a baby bassinet like a pro! So, let's begin! Why do you need a bassinet? Now, before we go any further, let me answer this all-important question. On the face of it, there is not much of a difference between a bassinet and a crib. But if you think about it from a practical standpoint, bassinets have advantages that cribs don't. Buying a bassinet before a crib is a very good idea for many reasons including the following. If you want to co-sleep with your baby initially before you can stand staying away from him/her for the night, bassinets are your best friends. There are many benefits of co﻿﻿-﻿﻿sleeping as well. Contrary to the cribs, bassinets are small and lightweight. You can easily pull a bassinet right next to your bed without a problem. Newborns can get hungry many times during the night, and they do need changing as well. If your baby is in the same room as you, all these activities can be done easily without you having to walk all the way to the other room. Bassinets can be great for this. You can have the baby in the same room as you in a bassinet and be at the beck and call of your baby all night long! Another significant advantage of bassinets is the fact that they are very portable. You can carry them to absolutely any part of your house effortlessly. With your baby in a bassinet right beside you, you can keep a closer eye on your baby in every room you go. So, now that you are convinced that bassinets are worth your time and money, let's take a look at some of the features you should be looking at before buying one. What to look for in a baby bassinet? Purchasing anything for your baby involves a lot of research, deliberation, and thought. Most parents want to be as thorough as they can, before purchasing anything for their precious bundle of joy. And they are right in doing so. Although a bassinet may not be the biggest purchase for your baby, it is an important one. Your baby is going to be spending a considerable amount of time in this thing, and hence, you should be careful in purchasing a bassinet. Here are some of the features that you should consider. As I said earlier, bassinets are light and portable. However, they can vary quite significantly when it comes to both size and weight. So, if you are considering a bassinet that you want to move around often, you should consider the weight and size of the bassinet. You don't want to end up in a situation where you get a bassinet that is too bulky or heavy to move around in the house. Another important consideration is the size. If you want to pull the bassinet right next to your bed, make sure that it is small enough to fit in that space. Safety of the baby is of utmost importance to any parent. Bassinets sold in the US must comply with the ASTM standards of safety. Make sure that the bassinet that you are picking complies with these standards. Additionally, many manufacturers also certify their products for being heavy metal-free and Aromatic Organic Compound-free. Look for such certifications. 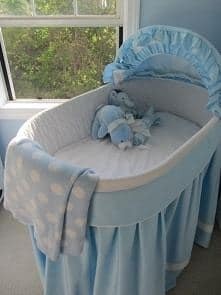 I understand that there is some sentimental value associated with reusing a bassinet that was utilized by a family member before, but it is not a good idea. Bassinets are not particularly strong and durable. In contrast to cribs, they are designed to be used for a relatively short time. Hence, there is a good chance that a used bassinet is not strong enough or it is missing a part. Hence, you should never put your baby in a used bassinet. One complaint that many first-time parents have about bassinets is the mattress. They think that it is too stiff or firm. Well, it is designed that way for a reason. If the mattress in a bassinet is too soft, it can cause obstruction of the airways and can trigger SIDS. Hence, don't be put off by an unusually strong and firm mattress in a bassinet. The side paneling is also important in a bassinet. You want to buy a bassinet that has a mesh wall so that you can see your baby and the baby can breathe without a problem even if his/her face lands up against the walls. Many bassinets come with a rocking mechanism that helps it to rock the baby back and forth. The motion can be soothing for a baby and help him/her to fall asleep as well. It is a good feature to have in a bassinet. However, make sure that if you are using this feature, don't leave your baby unattended. A lot of bassinets also have various sounds, lights, and toys for the baby. The most important thing to remember regarding these is the fact that all of them run on batteries. So, you might end up with having to buy a lot of batteries to keep these going! Some babies can be distracted by the sounds and lights as well. So, keep this in mind before buying a bassinet that makes sounds and lights. Some bassinets also come with inbuilt mobiles. They can offer visual and auditory stimulation to the baby. Having this feature can be a great plus. It is one of my favorite bassinets on the market. It is sturdy and yet Delta has managed to keep the weight down. It is ideal for infants up to 15 pounds in weight. The polyester fabric and the mattress covers are machine washable and hypoallergenic. The bassinet also features a music generating mechanism that produces some soothing tunes that will put your baby right to sleep! One of the features that I like is a special storage compartment below the bassinet itself. These compartments are great for storing baby supplies such as wipes and diapers. Another great feature is the retractable canopy. You can use this to shield the baby from lights in the room. The bassinet complies with all the ASTM and CPSC safety standards as well. The frame is made from stainless steel, and it can be assembled in less than 20 minutes. The Sweet Beginnings Bassinet is certainly one of the best bassinets on the market and deserves your consideration. Although the bassinet is great, the wheels can be a bit wobbly. You must pay attention while assembling the bassinet to eliminate this wobble. The Graco Dream is a 2-in-1 bassinet. It can transform into a changing station in no time. The bassinet is built like a tank and does not wobble or creak. One of the best features of the bassinet is the two-level oscillating mechanism that allows your baby to rock to sleep calmly. The locking wheels make moving the bassinet in and around the house a breeze. The retractable canopy is also a welcome feature. Another great feature is a storage compartment below the bassinet. It can hold almost everything your baby will need such as toys, wipes, and diapers. Overall, I am impressed with this bassinet. Sure, it is a bit expensive, but it does pack in quite the punch! The bassinet is a tad complicated to put together. That said, with a little bit of patience, it is certainly not impossible! The Pack N Play is one of the best folding bassinets on the market. It is lightweight, comfortable and sturdy. The automatic folding mechanism allows for folding the bassinet with just one hand which makes it very easy to use. The bassinet can also double up as a changing station if you are away from home. The walls are made from a high-grade mesh material that allows easy air flow. The fabric on the changing station is waterproof and can be wiped clean. One of the best features of this bassinet is the inbuilt mobile. Although the mobile does not operate on a battery, it is a useful feature nonetheless. The Dream on me bassinet is one of the best folding bassinets on the market. One of the most distinct features of this bassinet is the presence of a double canopy that pulls over from both sides. Once both the canopies are drawn, it protects the baby from light and weather elements. The bassinet is made from a polyester/ foam fabric that is durable and easy to clean. It is entirely stain-resistant and built to last. One of the best features of this bassinet is the unique folding mechanism. Once the bassinet is folded, it can be tucked away neatly in a small space or under your bed. The bassinet complies with ASTM standards. The liner of the mattress is a bit flimsy. Fisher-Price is a well-known brand when it comes to products for children and infants. So, when it comes to designing a bassinet, the company did a great job as expected. The Rock 'N Play bassinet is one of the lightest bassinets on the market. Contrary to most other bassinets, the Rock 'N Play Sleeper keeps your baby at an incline which is comfortable and secure. Although the bassinet does not have a battery-operated mechanism to rock back and forth, it is easy to rock. The uniquely designed feet of the bassinet allow it to rock with a gentle push. The bassinet has a three-point fastening system that keeps your baby safe and secure. The Sleeper is ASTM certified and is built to last. It is certainly a bassinet that is worth your time and money! After carefully testing and reviewing the best baby bassinets on the market, Delta Children Sweet Beginnings Bassinet is the clear winner. It combines great features and an affordable price. It checks all the right boxes and meets all the requirements for the best baby bassinet. The bassinet is sturdy and built to last. It is ASTM compliant and offers the best bang for your buck! I hope that this article will help you to make the right choice. If you find this information helpful, please share it with your friends.